Separate or combine beams with different wavelengths. These dichroic coatings allow one wavelength region to be transmitted while they reflect another region. They may be used as illustrated to separate or combine different wavelengths. This can be useful when working with alignment lasers or frequency doublers. Other wavelength combinations are available upon request. Please specify the angle of incidence and polarization of the reflected / transmitted light. These long-pass and short-pass coatings may be applied to any optical component to separate or combine different wavelength regions. They are available for normal and 45° angle of incidence. 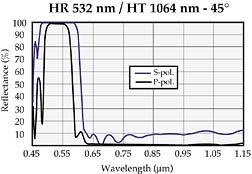 These coatings are highly effective for the wavelength of interest, reflecting over 99%. 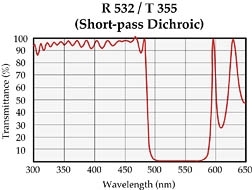 While they transmit over 85% of other nearby wavelengths, they are not blocked over a broad spectral range. These dichroic coatings allow one wavelength region to be ransmitted while they reflect another region. They may be used as illustrated to separate or combine different wavelengths. This can be useful when working with alignment lasers or frequency doublers.